The existing pedestrian barrier looked tatty and was costly to maintain. Painting had to be carried out every two years just to keep the fence looking visually acceptable. 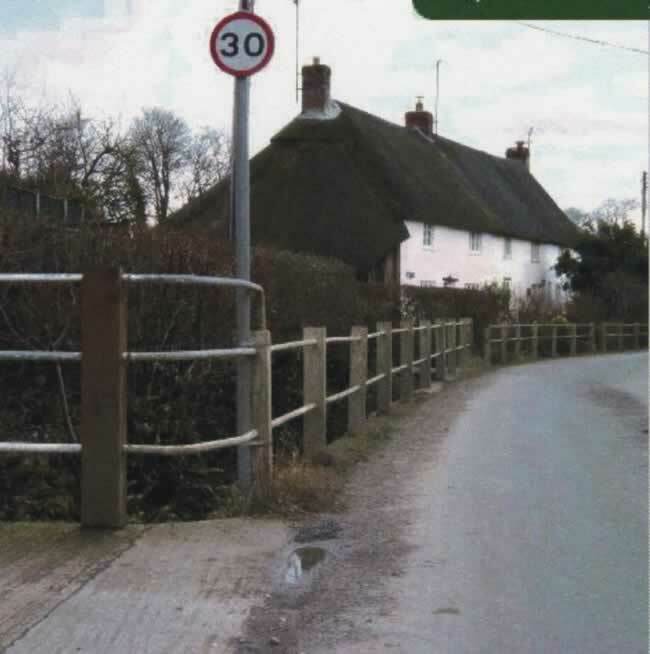 Being a major part of the village scene, the railings were detracted from the visual character of the village and making Alton Pancras looking unattractive. The fence was frequently being damaged by agriculture and heavy goods vehicles. This was costly to repair and produced a piecemeal patchwork appearance which visually looked a mess and also presented a highways safety issue. Dorset County Council contacted JACS UK Ltd and received a site visit from the company. They produced a mock up of a proposed handrail solution using a 100% Post Consumer Recycled Plastic fencing system. This was demonstrated to the local Parish Council and West Dorset Council Planners (due to it being in an Area of Outstanding Natural Beauty). Using the 100% Post Consumer Recycled Plastic posts as an alternative to concrete or metal helped both the county and the district authority meet their Sustainability Criteria. It also was received favourably by the residents of Alton Pancras as a positive contribution towards using recycled products in the area. The recycled plastic fence system complete with the unique socket system allowed Dorset County Council to facilitate a cost effective and quick solution to a long term maintenance problem. The Parish Trust who contributed towards the scheme, were very happy with the outcome and the speed at which the work was completed. Maintenance: the colour amp; materials were selected by the various parties to be low maintenance and because they did not require constant redecoration. “JACS recycled fence system was found to be a cost effective solution to an ongoing maintenance problem. It met all the design criteria and surpassed all the expectations of the parties concerned. It has provided an aesthetically pleasing result using modern materials in an Area of Outstanding Natural Beauty and could be a blueprint for further recycled fence systems in the Dorset area” Mr Cheleda also went on to say: “we have had very positive feedback from both the general public and Parish Council within Alton Pancras for this improvement scheme”.